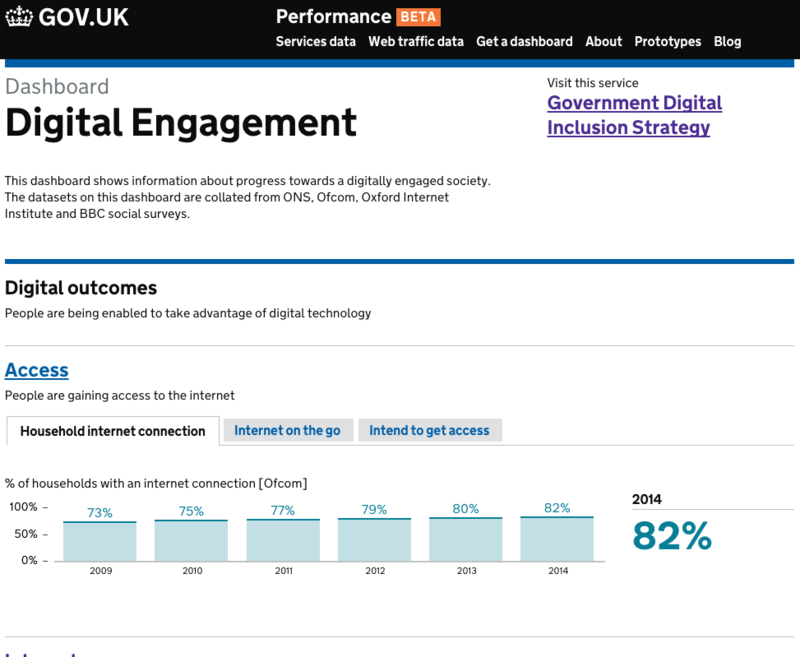 The Digital Engagement online dashboard is now on the GOV.UK performance platform. Here’s what it is, why and how it was developed and how we’ll be iterating it. The government's cross-sector Digital Engagement Research Working Group has developed this new dashboard as a tool to visualise and report on progress towards a digitally engaged society. A lot of data relating to various aspects of digital engagement - from a range of credible sources such as the ONS, Ofcom, the BBC and the Oxford Internet Institute - exists. But it is all published in different places, making it difficult to get a comprehensive view on progress. We identified a need to bring together all of that data into a single place online, and the dashboard aims to do just that. The dashboard will also support the implementation of the Digital Inclusion Outcomes Framework, a single, flexible template for tracking progress nationally and supporting more consistent local evaluation. 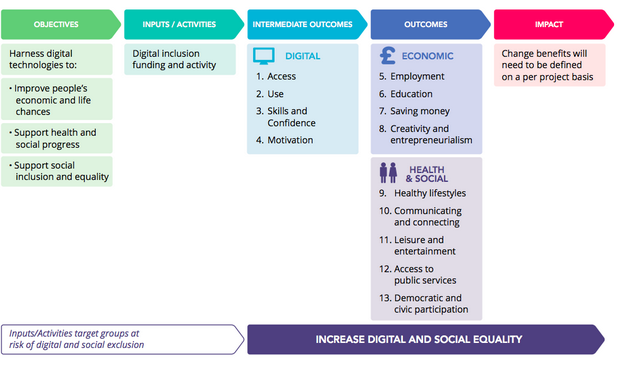 The dashboard tracks UK-wide progress towards outcomes on the Framework, grouped into three categories: intermediate digital outcomes, which in turn lead to wider economic, health and social outcomes (see below). Progress towards each of the outcomes is depicted by data corresponding with a set of indicators, which are specific, measurable ways of assessing whether a change is happening, or whether an outcome is being achieved. Ultimately, this dashboard should help drive, target and visualise the end results of collective, cross-sector efforts to support digital engagement. The Digital Engagement Research Working group identified indicators through an iterative selection process. Multiple: No single indicator is likely to correlate perfectly with any given outcome. Rather, indicators need to be seen as ‘proxies’, and a ‘basket’ of multiple indicators is required to provide a comprehensive assessment of progress towards any given outcome. Relevant: Although a wide range of data and measures on social and economic progress exist, this data is rarely correlated with digital access and participation. To measure progress on digital engagement, we rely on datasets making links between specific indicators and the use of digital technology. Regular and reliable: To allow ongoing assessment of progress it is essential that indicators can be tracked on a regular basis. This means that, at a national level, indicators must correlate with data that is collected regularly and reliably for the whole population. The final selection of indicators and corresponding data on the dashboard were chosen on this basis. We’ll review and update data periodically to reflect any statistically significant changes, as new data become available. There’s plenty of potential to add, remove and replace existing indicators if preferred measures and data sources are identified, or new ones become available. We’ll also work with our partners to ensure that data is presented in ways that help target activity and investment. For example, consultations have told us that a segmented picture of progress on digital engagement, which breaks down results based on local area and by socio-demographics, would be useful - something we’ll look at next. As always, we’re keen to test and iterate this tool with users, to make sure it’s relevant, useful and fit for purpose.